In the first of what we hope will become a regular interview series, we catch up with Malawi cichlid expert, ichthyologist, aquarist and webmaster Michael K. Oliver. Michael has a long-standing interest in the cichlids of Malawi and both his Masters and Ph.D. research concerned the systematics of African cichlids. He’s made a number of trips to the lake, diving alongside the fish and collecting specimens for scientific research, and has described some notable species including the rusty cichlid, Iodotropheus sprengerae, and sulphur-headed hap, Otopharynx lithobates. Since 1997 he’s also been running The Cichlid Fishes of Lake Malawi, Africa, an incomparably comprehensive, open access resource for anyone interested in the lake and its species. SF: Michael, you’ve been studying the cichlids of Malawi for almost five decades. How did you become interested in these fishes, and how has your passion been maintained? MKO: Great questions, but they don’t have short answers. Well, first came a general interest in fish, by the time I was ten or twelve. I’ve thought a lot about how that happened – because, why would it? I grew up in Los Angeles, but not near the ocean. My earliest memories involving fish are of a small aquarium in the office of my childhood pediatrician, and of several family visits to Marineland of the Pacific, an oceanarium (now long gone) with a giant ocean tank, smaller aquariums with fishes from various habitats, performing dolphins and seals – all the usual trappings. Staring up at the jacks and sharks and bright orange Garibaldis swimming around the huge tank must have made quite an impression on my sub-teen self. At 14 I got my first aquarium and soon started collecting books about fishes, including scientific books. I joined the Los Angeles Aquarium Society and became active in it, and haunted the local fish stores every few days (sound familiar so far?). By age 16, I knew I wanted to become a fish taxonomist. I became aware of Malawi cichlids during these teen years. In about 1966 I saw a couple of colorful species of mbuna at my local fish store (US$40 each, I think), and also remember reading an article about them in TFH. My mother and I traveled quite a bit with my father, a college English professor, during his sabbatical leaves every few years. When I was 17 we were planning a trip that included traveling through Africa from south to north. I successfully lobbied my dad to let me arrange a stop in Malawi; I wanted to see those colorful cichlids in the wild. I wrote to the Chief Fisheries Officer of Malawi (an actual paper letter in an airmailed envelope – this was the 1960s). 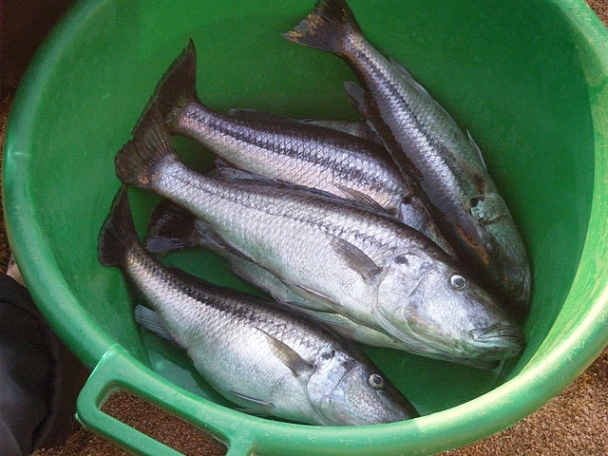 It was forwarded to the Senior Fishery Research Officer, Mr. David Eccles, in Monkey Bay. Eccles invited us to visit him there and promised to introduce me to the local fishes. Talk about a dream come true! David, an excellent naturalist, was a wonderful host during the couple of days my parents and I stayed in Monkey Bay. He organized collecting trips to the rocky shores of Thumbi Island East, and seining on the local sandy beach. We caught dozens of cichlids of many species, as well as cyprinids, catfishes, and even Aplocheilichthys johnstoni. I was like a kid in a … cichlid store. The sheer diversity of the cichlids was stunning (and only a couple of hundred species were known then). Seeing many of those 40-dollar cichlids at one time, glowing with color, fresh from their rocky habitat, also made an impression. Those two days with Eccles focused my future studies specifically on Malawi cichlids. Incidentally, he and I collected specimens of a pretty little rocky shore cichlid with three spots. David wasn’t sure what it was, and my continuing efforts to identify it back in Los Angeles and at the British Museum eventually showed conclusively that it was undescribed. Years later I described it under the name Otopharynx lithobates, and it has justly become a favorite in the aquarium. With that 1968 visit, I think I was the first American to visit Lake Malawi because of its fishes since the 1929 American Museum of Natural History collectors, R. and L. Boulton, caught a few fishes at Karonga and Deep Bay. I had taken lots of photos, and after returning home I wrote a three-part illustrated article for The Aquarium magazine about my visit to the lake, published in 1970. At the time, only mbuna were exported to the aquarium trade; my article emphasized that there were a lot of colorful non-mbuna cichlids that would be very suitable for the aquarium. When I later met Peter and Henny Davies, the first exporters, in Malawi in 1971, they told me that my article had persuaded them to begin exporting non-mbuna “haps,” which did indeed become very popular. As for how I maintain my interest – how could it be turned off, once started? I think E. O. Wilson’s idea of biophilia – an “urge to affiliate with other forms of life” – has merit, but I believe that some people also feel a more specific attraction to biodiversity. Certainly I do; in addition to my cichlid interests, I collect beetles, which make cichlids look depauperate! SF: How complete is the taxonomy of cichlids from the lake? Do you think there are still new discoveries to be made? MKO: Oh, certainly there are many species still to be discovered. About 400 cichlid species have been described to date from Lake Malawi. Between 450 and 500 additional suspected species have been collected, photographed underwater, or both, but remain undescribed. Just about any visit to a remote rocky shore produces further new discoveries, as do deep-water trawls in unsampled areas. If recent experience with other fish groups is any indication, there are also likely to be some cryptic species discovered among what we now regard as a single morphologically defined species. Beyond just recognizing and naming all the species, most of the details of their phylogenetic interrelationships are still unclear; when better understood, this is sure to cause extensive revision of their generic classification. SF: You recently described a new species which is interesting in a number of ways. Can you tell us about it? MKO: Hemitaeniochromis brachyrhynchus is the second species of its genus to be described. 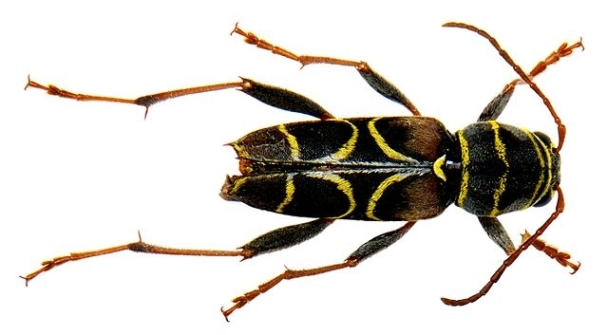 Compared to the much better known H. urotaenia, the recently named form is anatomically odd. The head appears scrunched up in front of the eyes because the superficial bone (the lacrimal) between the eye and the upper jaw is extremely narrow, giving the fish an unusually short snout (brachyrhynchus means short snout). The eyes are also unusually large. Circumstantial evidence strongly suggests that H. brachyrhynchus is a paedophage – one of the cichlids that steal and eat eggs or fry being brooded in the mother’s mouth. SF: Are wild Malawi fish still collected for the aquarium trade and does this practice have any detrimental effect on natural populations? MKO: Yes, there is at least the large enterprise founded by the late Stuart Grant (see http://lakemalawi.com) at Kambiri Point near Salima, Malawi. 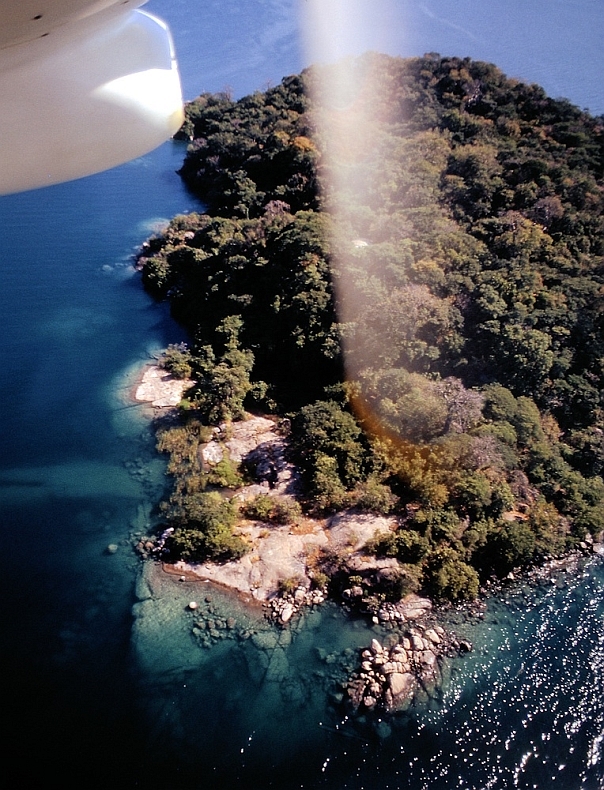 The most significant damage to natural populations by aquarium collectors was probably the intentional transplantation of cichlids between different parts of the lake by the Davies some 40 years ago, simply for their own convenience (for instance, taking Likoma Island endemic cichlids and releasing them at Thumbi Island West, over 200 km away). This selfish, reprehensible action allowed hybridization and competition between species that would never have encountered each other naturally, and further complicated attempts to understand the already extremely complex natural distribution patterns of the cichlid species. 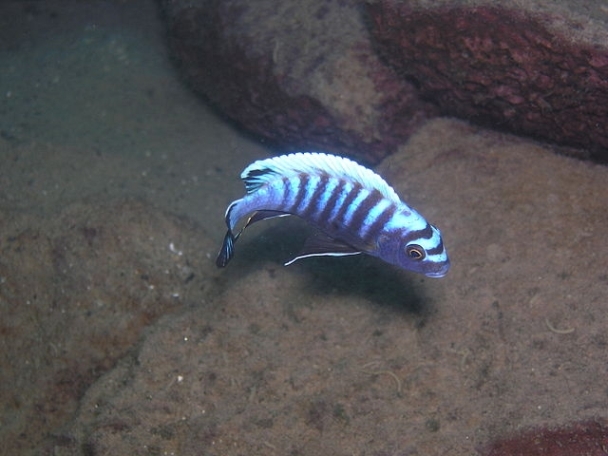 I’m not aware of any instance where overcollecting for the aquarium trade has seriously threatened a cichlid population in Lake Malawi, but given the small size of the populations of some species, an irresponsible collecting operation could definitely reduce a population (and even some entire species) to a level where it could not sustain itself. SF: Do you think that the speciation of Lake Malawi cichlids will ever stop, and is it possible that some extant species may disappear naturally as a result of the ongoing speciation process? 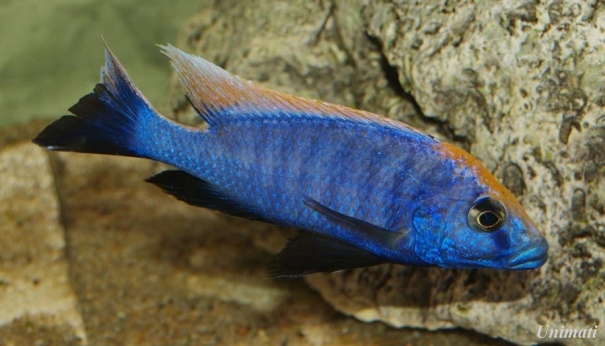 MKO: As long as there are cichlids in Lake Malawi, they will continue to differentiate and speciate, facilitated no doubt by continued fluctuations in lake level which isolate and reconnect stretches of rocky shore, and by other factors such as changes in female preference for male coloration. Extinction is also a natural process. Many species have surely arisen only to disappear within the lake, and more will do so. I like to imagine that, a few tens of millions of years from now, as the two tectonic plates between which Lake Malawi lies continue to pull apart – the Rovuma plate on the east, the main Nubian plate on the west – the lake will become connected to the southern Indian Ocean and some future cichlids will adapt and invade the coral reefs. SF: What do you see as the biggest challenge(s) facing the lake in the future? MKO: Unfortunately, I think there are several. 2) Siltation from agricultural runoff into the lake is occurring, notably in the southwest near Salima. 3) Chemical pollution from agriculture could also increase, its effects aggravated by the long turnover time of the lake with its single outflow, the Shire River. 4) Oil spills from planned drilling in the north are a potential concern. SF: What do you consider the most important items to pack when on a Malawi field trip? MKO: I’m afraid it’s been a long time since I was there. Some obvious suggestions: For fishwatching, snorkel and mask (fitted with prescription lenses, if needed); a neoprene vest; for SCUBA: your second-stage regulator, dive computer, c-card, dive log, maybe a camera; extra batteries (perhaps rechargeable, with charger) and extra digital storage media. The friendly and helpful local people always appreciate a few inexpensive gifts such as wristwatches and tee-shirts. SF: Finally, perhaps inevitably, fish or chips? MKO: Both, of course! Keeping to Lake Malawi, grilled tilapia fresh from the lake are hard to beat, but smoked mcheni (Rhamphochromis) are also delicious, if rather bony. Even dried usipa (Engraulicypris sardella) are interesting to taste – once (it probably helps if you like the taste of gallbladder…). SF: Mmmm, gallbladder! Michael, it’s been a great pleasure having you take part in our first ever SF interview. Thank you very much and all the best for 2013! MKO: Thank you so much for the honor of being your first interviewee! It has been an entirely positive experience.